Leah Pattem shares what it's like to be on the front line of an eviction. I’d heard on the radio that there was going to be an eviction at 11 am, just a five-minute walk from where I live. I turned on TeleMadrid and their cameras were already there. I put on my coat, grabbed my camera and said to my other half, “look out for me on the TV”. Rosa, who’d been living in her three-bedroom flat on Calle Argumosa for more than 20 years, was the latest victim of property speculation. 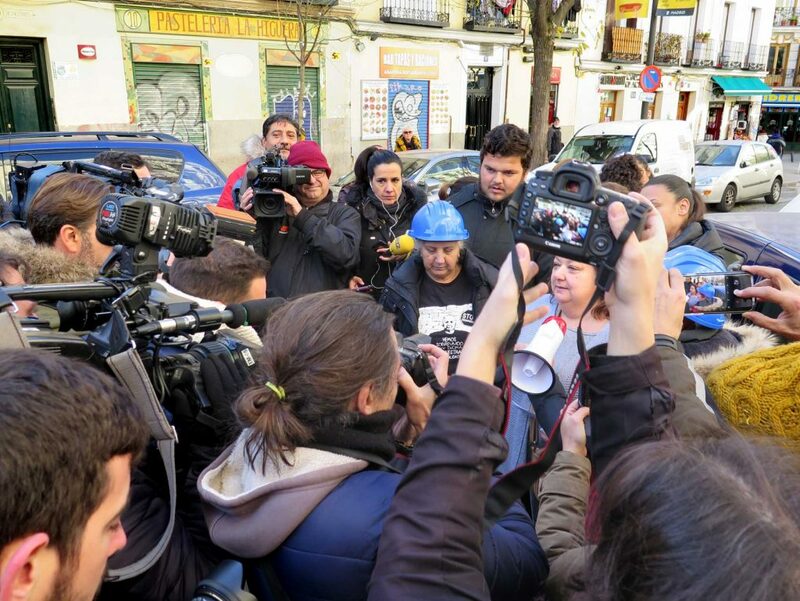 Her building had recently been bought up by investors demanding an increase in rent from €400 per month to €1,700 – a distorted hike with one objective: eviction. 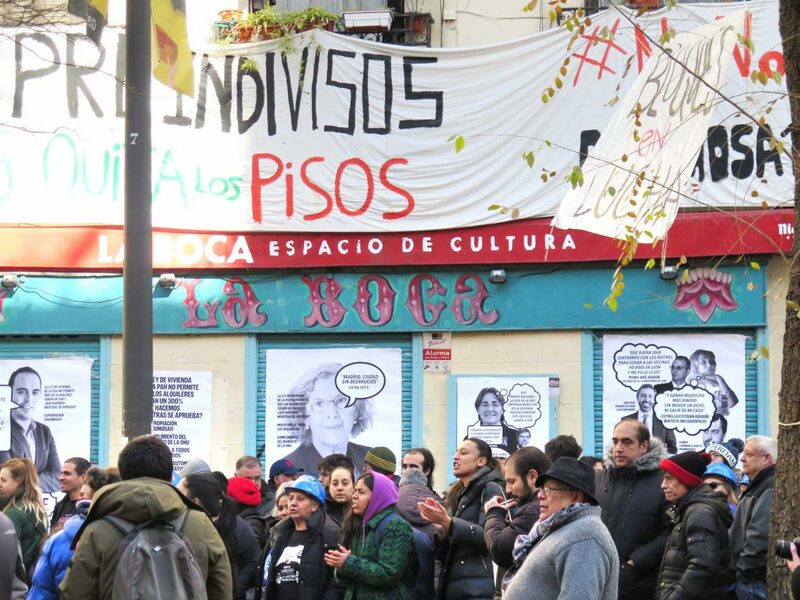 Lavapiés, the neighbourhood that both Rosa and I live in, has always been – and still is – a working-class barrio. Most residential buildings here were quickly erected centuries ago to house a flood of economic migrants from elsewhere in Spain but, today, these buildings host some of the smallest flats in the country. In recent decades, Lavapiés has also become home to migrants from Asia, Africa, the Middle East and Latin America. Walk through the narrow, sloping streets of Lavapiés and see spice shops and Latin diners oscillating between old traditional Spanish shops – it’s a beautiful neighbourhood, if you ignore the crime, filth and inequality. I squeezed through the TV cameras filming Rosa, who’d come to join the 100-strong protest outside her flat, and found Carlos, the leader of this tactical operation. He explained to me that he believes, for being an EU country, Spain is quite unique in its cruelty, evicting families with young children. There appear to be no laws in Spain that protect tenants from investors buying up their rented property and throwing them out. 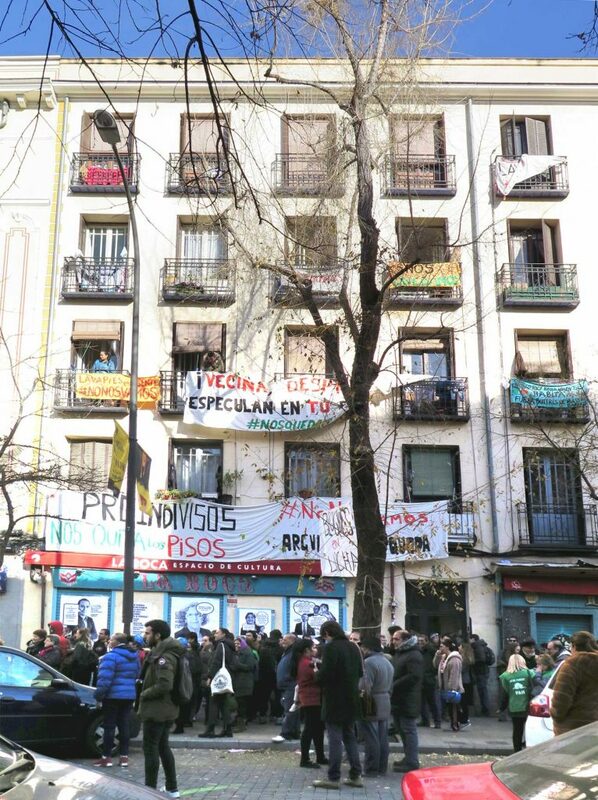 These evictions – one occurs every eight minutes – are even more disturbing when you realise that around 3.5 million properties currently sit empty across Spain. I spoke to several others in the crowd; they were all victims of evictions. 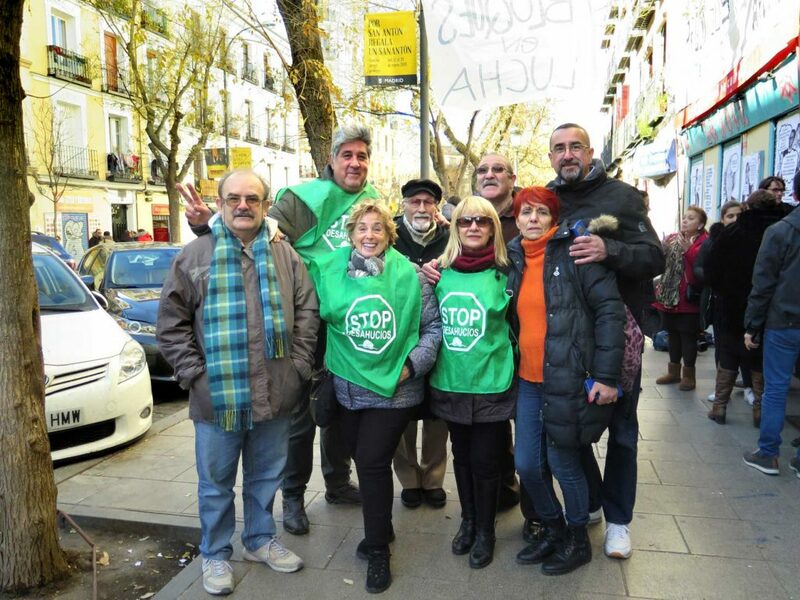 Their trauma and misery had quickly turned to anger, which led them to join Stop Desahucios, where Carlos (Pictured above in green) and his warriors convert rage into activism. 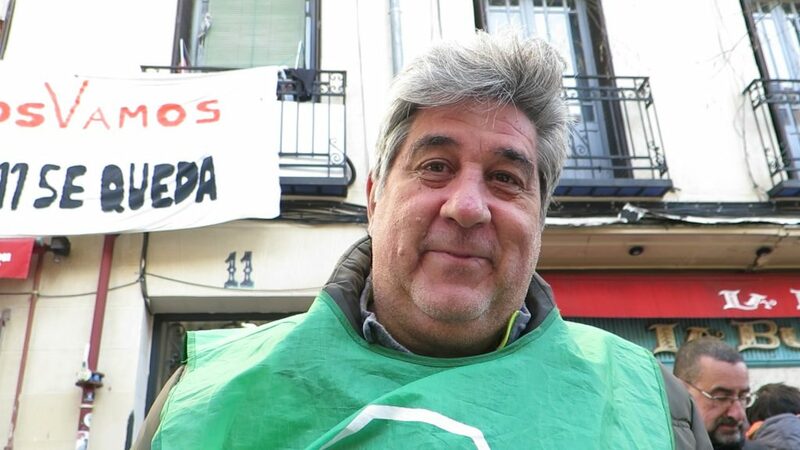 Stood outside the evictee’s home in their well-known red and green vests, the activists chant, scream and envelop the building in spray-painted bed sheets. They make the whole city aware of what the landlord is doing, which is humiliating and bad for business. 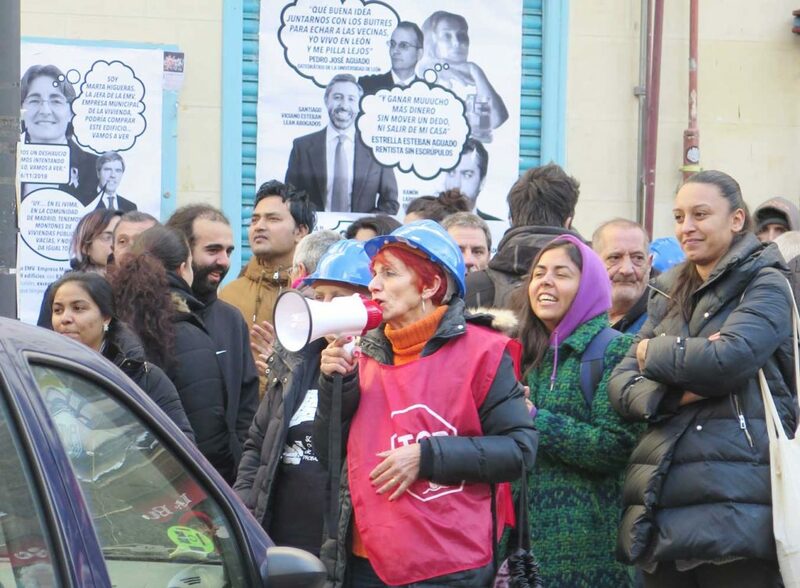 Stop Desahucios activists pull back tenants from the edge of losing everything. Their success further empowers them all and, in the process, they gain a new warrior. Chanting suddenly turned to cheering and Rosa was absorbed into a crowd of hugs. "We’ve won! The landlords negotiated with Rosa and she’s been given one more month to stay. So, we’ll be back here again in a month." In this building alone, Rosa is the tenth eviction that Stop Desahucios have either stopped or delayed, with a further two prevented in the last week, making Calle Argumosa 11 an iconic example of what this unstoppable force of people can achieve. If your contract expires, your landlord wants to increase your rent and you accept their increase, you’ve become part of the problem. Negotiate hard. This comes with undeniable risk: if you lose, you’re out and someone else will turn up willing to pay the price you walked away from, so stop them: negotiate to stay for what you believe is a fair price. If you anticipate eviction for any reason (speculation, job loss, personal crisis, rent increase), get in touch with Stop Desahucios. By fighting your battle, we come one step closer to winning the war. Stop Desahucios are Spain-wide. Find your city’s organisation here. For Madrid, find your neighbourhood group here and get involved by attending one of their upcoming events listed in the calendar. Follow PAH (Plataformas de Afectados por la Hipoteca) on Facebook and Twitter.